Employs the “5 Dimensions of Learning” framework to aid students in learning Mathematics. thinking which constitutes good habits of mind. Through fun and interesting activities with contents that are in line with school syllabus, our programme helps to improve students’ perceptions towards Mathematics. Provides opportunities for them to use thinking skills to acquire, extend, refine and apply their knowledge to situations that they will encounter in life. Be guided on the path to explore creative ways in which they can employ to solve different types of Mathematics problems and they will also be taught various methods that they can use to critically evaluate their answers. This serves to help students improve their understanding of basic Mathematics concepts, which will help them to achieve better examination results. Our “Thinking Minds Edition” explicitly encourages students to develop a set of positive habits of minds, which is in line with Ministry of Education’s vision of Innovation and Enterprise. Students who have both thinking skills and thinking habits are in a better position to solve unusual problems. The competencies encouraged by the programme are important life and work skills that students will need to equip themselves with so as to deal with the new challenges in the 21st century. These are skills essential for a knowledge-based economy. Centres on a main problem, there may be follow-up related problems. Through the process of solving the main problems, students will be engaged in one or more of the five dimensions of learning. Involves the use of concrete materials to help students relate mathematics concepts to common things they will encounter in everyday life. Provides a variety of opportunities for students to engage in some kind of ‘looking back’ or re-capping of lessons learnt before to help them consolidate their knowledge. Revision Programme - choose topics that students have learnt the year before. Preparatory Programme - choose topics to be done in the subsequent term. Remedial Programme - by selecting topics that students have difficulty in. 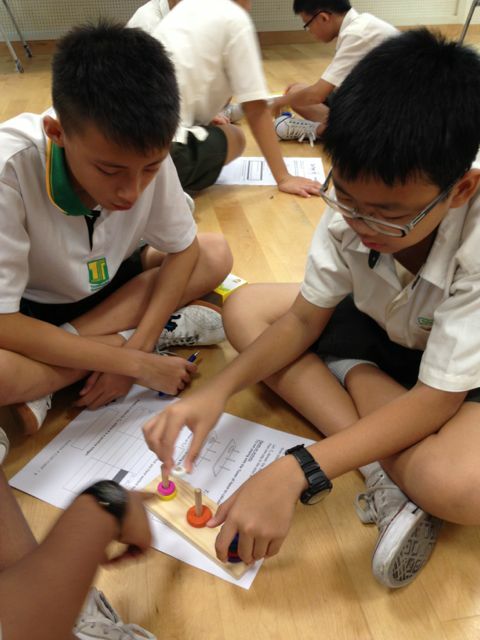 Tower of Hanoi - not just 2D! Examination Questions that require thinking ability can be included at the end of some lessons for students to practise. Learning Portfolio - to document their best pieces of work throughout the programme. 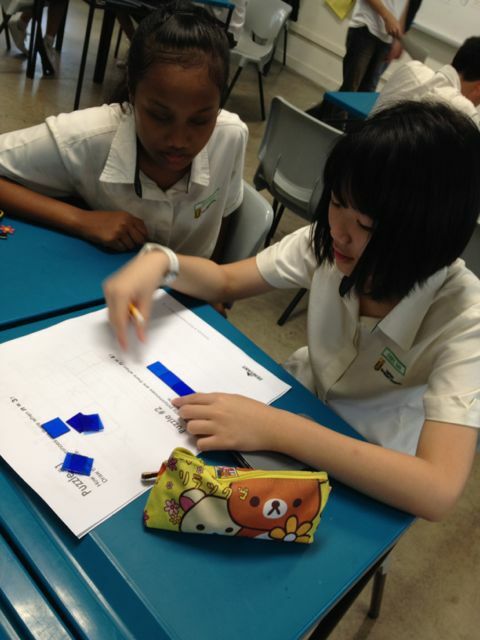 Mathematics Game – create game and to evaluate other groups’ work. Make A Product - such as a gift box or other geometrical objects. Journal - to document their learning journey.